There are many great recipes from some of the world’s greatest cooks and chefs. I’m not exactly overwhelmed with giving this recipe for my on the fly grilled pork chop dinner. However, because there have been requests for how this was done in The Unknown Cook’s kitchen, we are going to post it up here. 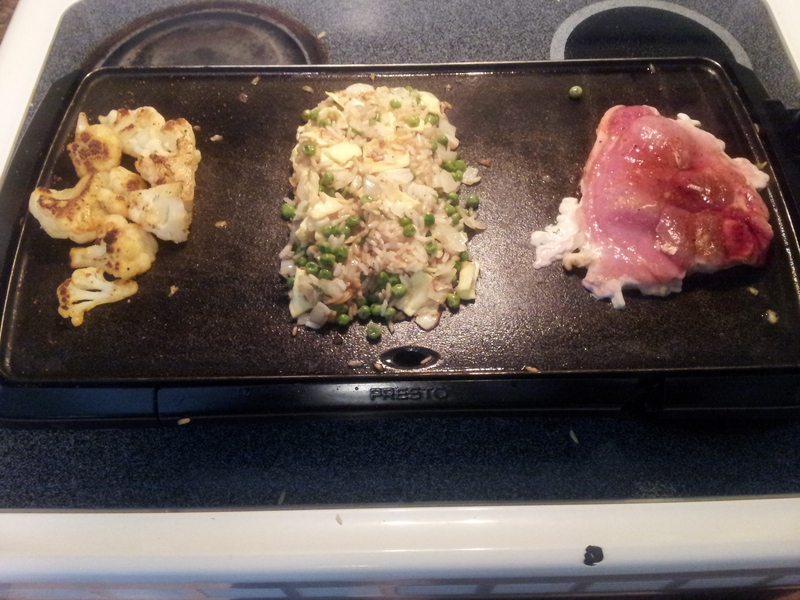 Preheat Griddle to 300 degrees Fahrenheit and coat with 2 tablespoons of olive oil. 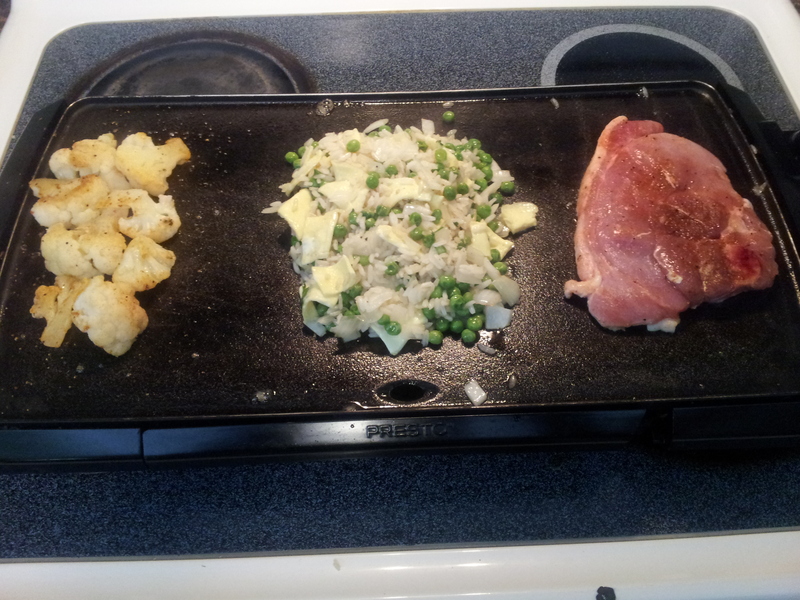 Season the pork chop with your favorite seasoning and set it aside for later. Chop the onion into 3/8 inch squares and place in holding dish. Remove frozen peas from freezer and place 1/2 cup in holding dish. Whip 1 egg and place in holding dish. Chop up the parsley into desired consistency for garnish. Now that all ingredients are prepped and assembled, we can begin cooking. Is your griddle hot enough? 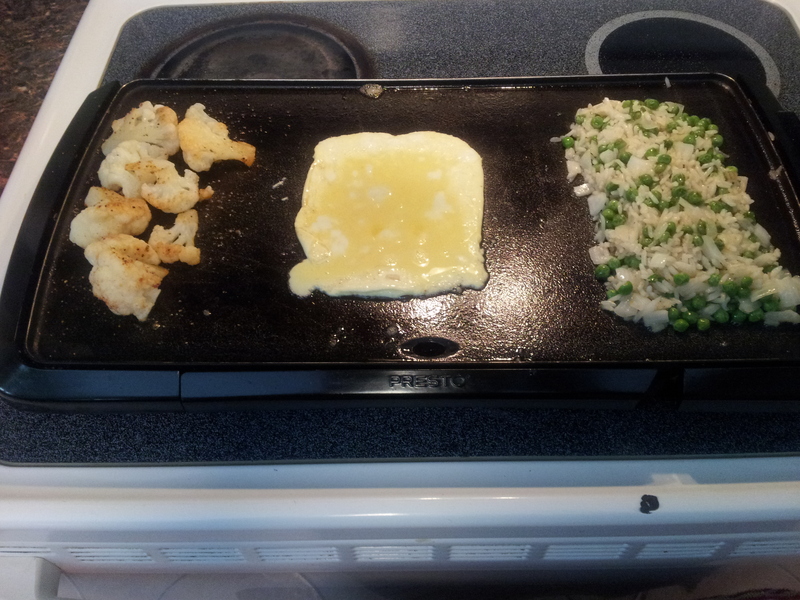 Drop a couple of grains of rice in the center of the griddle. If it starts to dance from the heat, you are ready to go. I chose 300 degrees to cook at as it reduces any chances of me burning anything. If you are fast enough, you can increase the temperature to your comfort level of cooking. I chose cauliflower as my vegetable to serve with this meal. Place your vegetable of choice on the left side of flat top. Place your frozen peas onto the surface next. Now place your cold done rice onto the surface and sprinkle desired amount of fresh parsley on top. Let peas and onions cook for about 2 minutes before turning. After turning, and another 2 minutes elapses, your onions should start a translucent state. 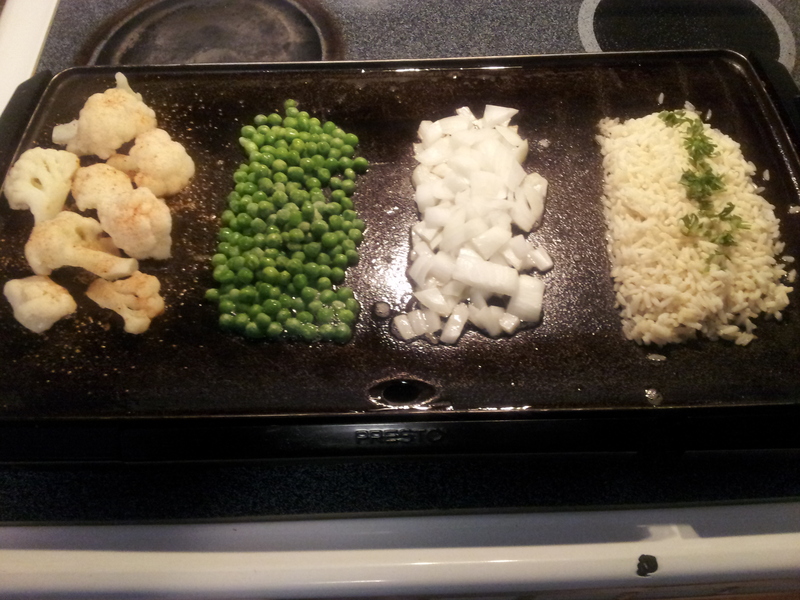 You can now combine your peas, onions, and rice together mixing evenly on your flat top. Add more olive oil if needed to prevent sticking. If cauliflower is your veggie of choice, you can turn it now. There should be a small touch of brown color on the surface of the cauliflower. The rice is now mixed and ready to finish cooking. At this point, you can add Teriyaki sauce or soy sauce to your rice. Add to suit your taste. If you prefer more vegetables or meat in your rice, it is okay to add. The important thing is to ensure your rice is cold. Rice that is freshly cooked and then attempted to be fried while it is still hot can leave a sticky mess. Let’s move on to the next steps. Place your rice to the far right of the surface. You may now place your egg mixture in the center of the flat top. Let the heat help you to form the egg into a square if you want small, flat squares in your rice mixture. Otherwise, you can scramble the egg if you desire. If doing small squares in your rice mixture, flip the egg square over to allow to finish the cooking process. 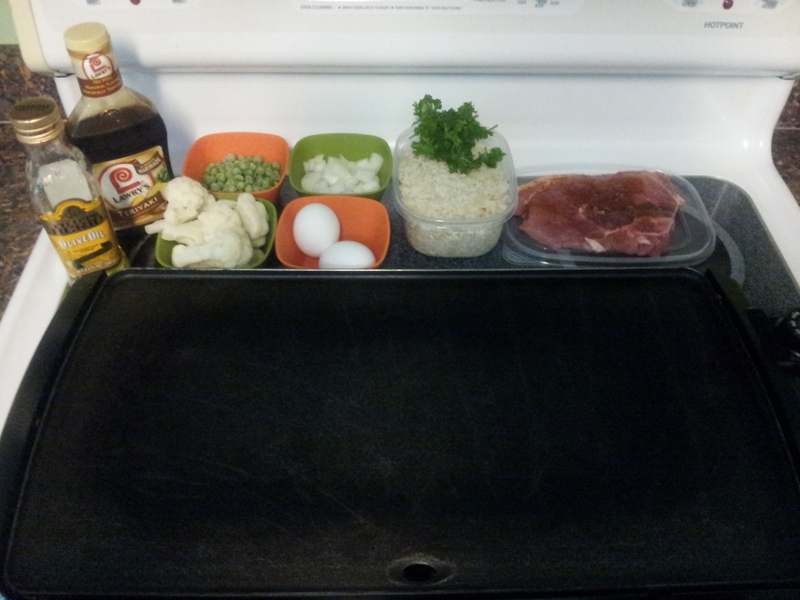 Mix the egg squares into your rice evenly. Isn’t that color lovely? Check your cauliflower. We don’t want to burn it! We are almost at the finish line. The final steps are quite simple. Pull your rice mixture to the center of the flat top. Place your seasoned pork chop to the far right side of the surface. Pork chops don’t take long to cook. Cook 4 minutes on one side and flip for an additional 4 minutes on the other side. The cook time can vary based upon the thickness of the chop. We want to avoid dryness of the meat. We also want it to be done! Below is the finished dish. You can do this entire meal right from your flat top. Trust us when we tell you, your family is going to love it. If you want to see more great dishes and connect with some extraordinary everyday cooks, join us at The Unknown Cook group. It’s a cooking and learning paradise! 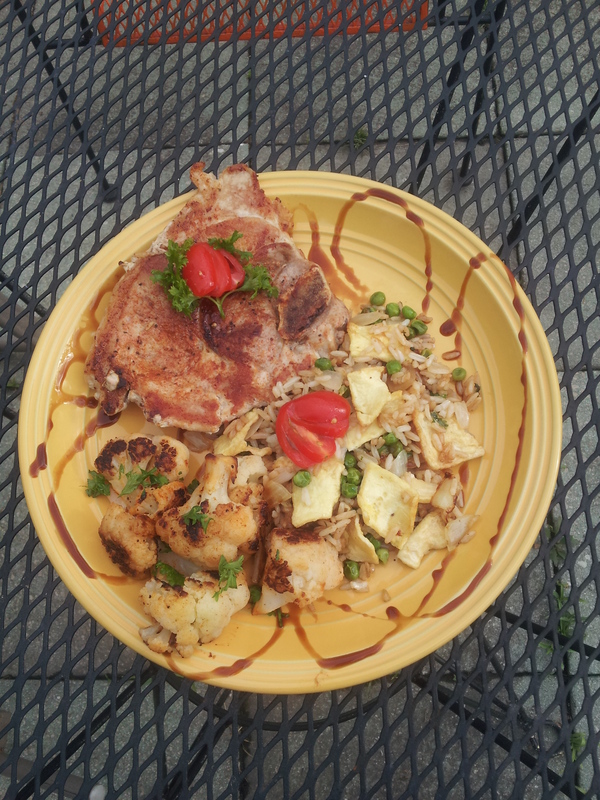 Grilled Pork Chop with Cauliflower and Fried Rice. This entire meal was done from an electric flat top grill! Tip: There are many different ways to go to finish off this dish with a garnish. I chose to use cherry tomatoes which I carefully sliced into a fan. Hold the cherry tomato between the thumb and forefinger. With a good, sharp paring knife, slice from the left edge of the tomato to the right. Ensure there is equal distance between your slices. Be sure to only slice the front edge of the tomato completely. This will allow you to easily twist the slices into a fan. You can do this easy trick with other fruits and vegetables too! Posted on August 4, 2014, in Uncategorized and tagged cauliflower recipes, fried rice, fried rice recipe, grill temps, grilled cauliflower, grilled pork chops, grilled rice, pork chop recipes, pork chops, pork loin chops, pork recipes, pork temperature, presto griddle, presto grill, seasoned cauliflower, seasoned pork chops, vegetable rice. Bookmark the permalink. Leave a comment.